Our clients were very specific with their property investment requirements for this purchase. They wanted a property that provided good capital growth potential, but it also needed to provide good cashflow. 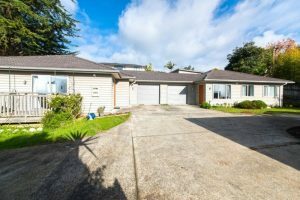 We purchased this home and income investment property for 1.3M in an increasingly popular suburb, New Lynn, in West Auckland. A very attractive area for tenants, this property is in a good location, offering relatively close proximity to New Lynn town centre, schools, train station, motorways, bus routes, shops, and amenities. On the full site is a 4 bedroom 2 bathroom house, along with a 3 bedroom, 1 bathroom house. Both dwellings on the site were constructed in 2010. Being recently built, they are low maintenance. The property is fenced and has an easy-care section well suited for tenancy. On settlement the property was ready to rent straight away and is currently rented for $1160 p/w, providing a yield of 4.64%. ← Property syndication – who can participate?